The trending definition of “Customer Service” is “figure it out yourself” or “customer self-service.” You may get your problem solved if you are lucky and persistent enough to gather the information you need from the maze of reps. Then, maybe you can piece together the solution yourself and tell a willing agent what they need to do to fix it. 1. That recording that says, You can solve your own problem on our website to avoid waiting for us to talk to you. Duh. Looked already. I would do anything not to have to call you. Or worse, “If I could get to your website, I would have. I am calling because your site is down.” I will tell you where to put your FAQs. 2. Can I just verify who you are? All I need is a little information: phone number, address, last 4 digits, last payment on your account, account number? My account number? “You want to know who I am? Can I verify who YOU are?” Seriously, you don’t have my account number from the phone number? Can you look on your recent bill, please? Bill? A paper bill? I would have to log into my account to get that. 3. Now what can I do for you today? Don’t you have the record of the last 8 times I have called? Let me explain the problem again. 5. I need you to go through a few steps first. Yes, we have done that before. Can I speak with a tier 2 technical support person? Just bear with me, I need to go through these steps first. I am sure we can fix it. I know that’s what it says on the script you are reading, but I have heard it all already. 6. Hey, do you know who I call for a cablecard problem? Exact words of the Comcast tech at my house “phoning a friend” to help him figure out who at Comcast, his own company, to call to help him fix my problem. Not a confidence builder! 7. Hello, this is Comcast advanced technical support calling from India to help you with your problem. Uh, would you like to speak with the Comcast technician who is here at my house? Who did you say you were? says the Comcast technician to the Comcast India advanced technical support. 8. This is what we feel is best for you. We are going to give you another box, exactly like the one you have and see if it works better. Always good when they can tell you what is “best for you.” The younger the tech and the closer to California, the greater the arrogance and condescension. 9. 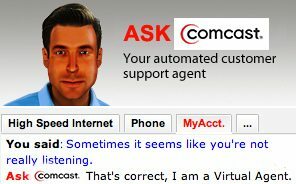 This is Comcast, how may I direct your call? Things seem to get fixed only when customer service means that the customer is providing the service. * Teresa and I worked together for many years at the World Bank in IT services. Early on, she headed the first centralized helpdesk and pioneered the provisioning of standard PCs. Later she led the effort to standardize software development processes and coordinated the IT governance function. She also has a well-deserved reputation as a thoughtful critic and underground satirist of institutional dysfunction. Great post Teresa. Might I add……”Can I put you on hold?” followed by some music sure to annoy you?